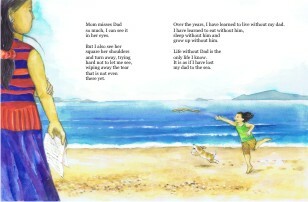 This is the first of ten seafarer children’s books that came out recently. The brainchild of Marissa Oca Robles, these books are dedicated to seafarers’ children all over the world. Raechelle Castellon is a freelance writer. She lives in Quezon City with her five-year-old daughter Eleanor Iskra. “Lost At Sea is a story that is a product of something bigger than me,” she says. She is not a daughter of a seafarer or overseas Filipino worker (OFW), but she has friends who are. She saw how many of them grew up feeling resentful and estranged from their absentee parent who, they later realize, were working not only for them but for their extended family as well. Can that story be told to young children? Raechelle does, in Lost At Sea. Maria Bernadette Solina-Wolf is a freelance artist. She tends a “rainforest garden” and runs a retreat house with her husband Michael in Puerto Galera, Mindoro Oriental. Her illustrations for this story were inspired by memories of her growing up years when her father worked abroad as a soldier in the Vietnam war and as an overseas Filipino worker (OFW) in Saudi Arabia. 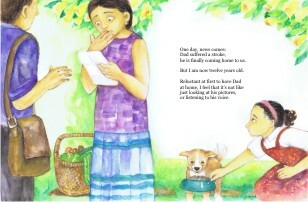 Her other children’s illustrations are in Marla Chorengel’s Why The Sky Is High, Jane Urbanek’s Nanay Kuwago, and Amelia Lapeña-Bonifacio’s Kasi-Kasimula series. 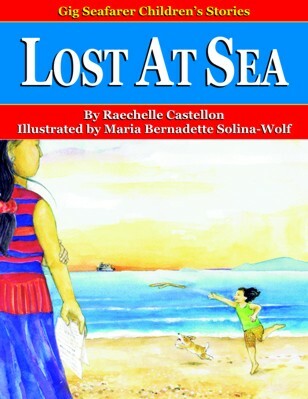 This book is part of the Gig Seafarer Children’s Stories series. It is published by Gig and the Amazing Sampaguita Foundation, Inc. (GASFI), a nonprofit organization founded and headed by Marissa Oca Robles. GASFI is driven by Marissa’s three passions: honoring the memory and youthful spirit of her son Gig, promoting the reading habit among children and their parents, and serving the needs of Filipino seamen’s families. The first has to do with turning the loss of a loved one into life-affirming action. When her son died in an accident, Marissa founded GASFI to celebrate his love for books, his tender affection for sampaguita flowers, and his frequent use of the word “amazing” to describe his life and almost everything in it. The second is about kindling and sustaining a life-long love for reading among children and their families. “Twenty Minutes At Bedtime” is not only GASFI’s slogan, it is also the minimum amount of time, Marissa believes, that parents should set aside everyday to read with their children. 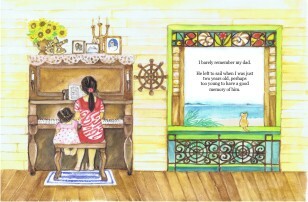 The third is Marissa’s special contribution to her family’s cause: the welfare of Filipino seamen. Her father Captain Gregorio S. Oca laid the cornerstone when he founded the Associated Marine Officers and Seamen’s Union of the Philippines (Amosup). Marissa builds upon it by running seamen’s villages, hospitals, schools and libraries throughout the country. When you read and share this book, you join an ever-expanding circle that gathers round people and things that warm the cockles of our hearts: our children, books and reading, and the strength and resilience of families – especially where the father is mostly away at sea. This book is based on a prize-winning story, one of ten winners of the Gig Book Storywriting Contest conducted by GASFI in 2009. Close to 150 stories were submitted for the contest. The ten best stories were selected and edited for publication by publisher and children’s author Karina Africa Bolasco, book reviewer and children’s author Neni Sta. Romana Cruz, and Beaulah Pedregosa Taguiwalo. Book design, art direction, and pre-press production by Beaulah Pedregosa Taguiwalo, color separations by iColours, printing by Raintree Trading & Publishing, Inc. Inside: Full color, Matte 120 lbs. To know more about a particular book, click on the corresponding numbered tab at the top or on the Page number on the right. The corresponding pages will be completed as each book is printed.